There is no such Madison quote about America being based on self-governance according to the 10 commandments. Even Ted Cruz’s historian, David Barton, now labels that quote “unconfirmed.” By all accounts, the quote cannot be found in any of Madison’s writings or can’t be traced to any primary source. Someone should tell Phil Robertson that several of the quotes Barton used in his first book cannot be found in primary sources. Last week, Gospel for Asia issued a press release claiming to help thousands of leprosy sufferers. WILLS POINT, Texas, Jan. 28, 2016 /Standard Newswire/ — Gospel for Asia (GFA)-supported missionaries and workers will reach out with food, clothing and medical aid on Jan. 31, World Leprosy Day, to more than 4,000 sufferers in 63 leprosy colonies, highlighting the plight of those suffering from this brutal, but highly treatable disease. GFA’s track record in recent years does not inspire confidence that funds donated for leprosy care will get to the victims of this dreaded disease. According to GFA’s project giving reports for 2011-2013, donors have given $284,528 designated for leprosy ministry. However, only $36,600 has been reported on Indian government forms as being received in India during the same period. On the FC-6 form, a specific line item exists for reporting foreign donations given to assist with leprosy treatment and outreach. Only about 13% of gifts designated by donors to GFA in the United States was reported as received by GFA’s field partners in India. Due to giving in prior years, GFA had amassed a balance of nearly $400,000 in an account to help leprosy treatment as of March 31, 2014. Using funds from that account along with a small amount of the actual donations, GFA reported spending of just over $180,000 on leprosy care from 2011-2013. That is still over $100,000 less than donors gave. As with other needs, GFA has built up a balance in this account for reasons they have not disclosed. Even while GFA continues to solicit donations, organization leaders have significant funds waiting to be used in keeping with donor intent. David Barton, Glenn Beck and World Net Daily have promoted the fiction that only liberals have criticized David Barton’s history. I have debunked that here. This week a very conservative writer came out with concerns about Barton’s history and theological teachings. At several location, Marsha West has a sharp critique of Barton’s work and his association with Glenn Beck. The most surprising source to run West’s article was RenewAmerica. I dare Barton and company to label RenewAmerica liberal. Big time liberals like Bryan Fischer, Cliff Kincaid, Jerry Newcombe, and Alan Keyes write for that site. In fact, Keyes is the founder and honorary chairman for the venture. This could be a very important development. See this Christianity Today article for the full story on the Marrakesh Declaration (Declaration website). Muslim leaders affirm the rights of religious minorities in Muslim majority nations. Pakistan, we are looking at you. Time to release Asia Bibi. Ted Cruz’s evangelical strategy may not be working as well as he hoped. Mormon Glenn Beck and activist David Barton may feel Cruz is the one but increasingly evangelicals may be moving toward The Donald. Calling a vote for John Kasich a blow to “divisive demagogic candidates,” the Boston Globe endorsed Kasich in the New Hampshire primary on Feb 9. 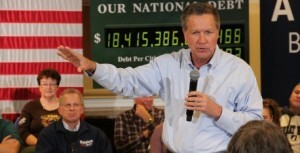 The Globe calls Kasich a moderate conservative and touts him as a candidate who can get results. 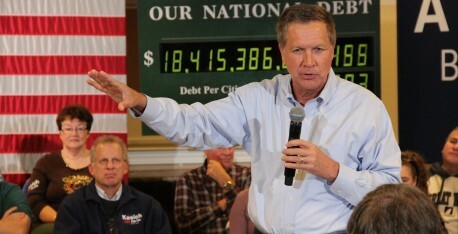 He has shown independence as Ohio governor and is a fiscal conservative. Whether it is Kasich or Rubio or Bush, I do hope someone other than Trump or Cruz makes a strong showing in NH. Yesterday, I posted a link to a Memphis missions conference which featured Gospel for Asia’s K.P. Yohannan as a speaker. Today, I have learned that the Downline Summit conference director is now telling people who ask that Yohannan and the organizers have agreed Yohannan will not appear. A trip to the conference website fails to find Yohannan’s picture or any references to GFA. Another organization which has not decided what to do with K.P. Yohannan is the Global Medical Missions Alliance. Yohannan is slated to speak at their 2016 conference. Recently, Joy Kim, representing GMMA, told me that the GMMA board has been deliberating about Yohannan’s role at the Irvine conference in late June. Many will scratch their heads. Some will complaint and maybe stage a protest. Some donors will stop giving to Liberty but The Donald will no doubt make that up going forward. In a CNN poll dropped today, Donald Trump leads all others among evangelicals with 39% favoring him. I think I understand this now. Trump is rich and famous. These are two values celebrated among modern evangelical pastors. Trump is the perfect candidate for those who equate wealth and fame with God’s favor. Millions of people have been conditioned to admire wealth and fame as measures of success in the church. A big ministry must mean big blessing. Trump seems made for evangelical prime time. On one hand, I am glad that a majority evangelicals are so far resisting the dominionist calls of Ted “Anointed” Cruz, but on the other, they are moving toward the new values of the church: wealth and fame. Instead of moving toward an ideologically less pure but experienced candidate like John Kasich, the church is distracted by the promises and pretty lights of Trump Towers.